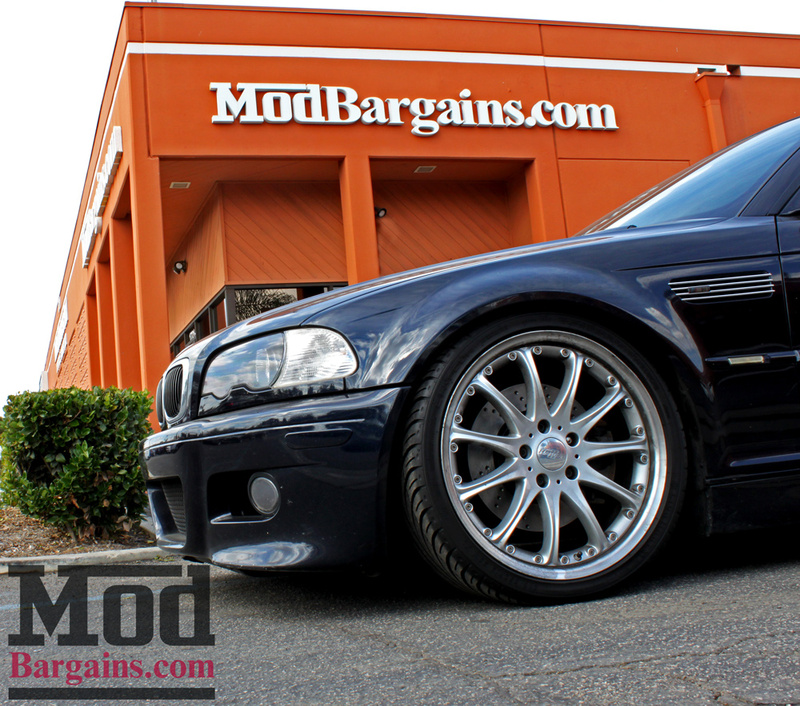 Upgrade braking and appearance with this ModBargains StopTech Stage 2 Brake Upgrade kit with drilled rotors for the E46. 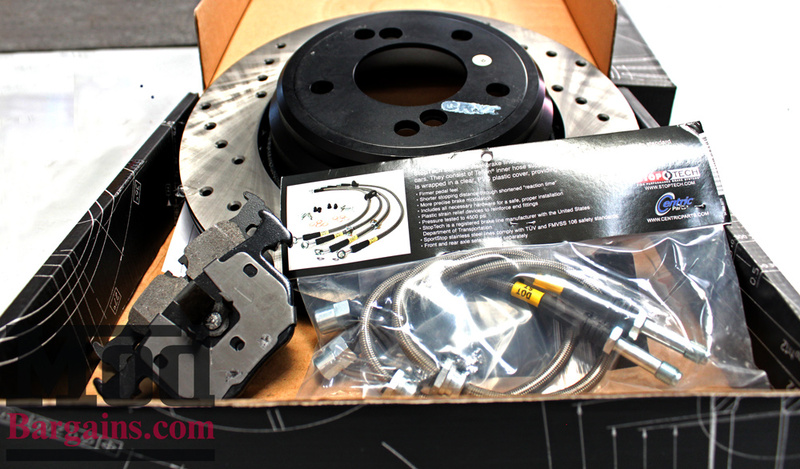 Improving braking and appearance with this affordable ModBargains StopTech Stage 2 Brake Upgrade Kit with drilled rotors for the E46 3 series and M3. This brake upgrade kit includes, front and rear rotors StopTech Drilled Rotors, front and rear StopTech Performance Brake Pads, stainless steel brake lines, and 3 bottles of StopTech STR600 Brake Fluid. This upgrade kit is ideal for anyone who's brakes are nearing the end of their life, and are looking for an improvement in braking. Your OEM rotors may be blank or slotted, depending on your options. 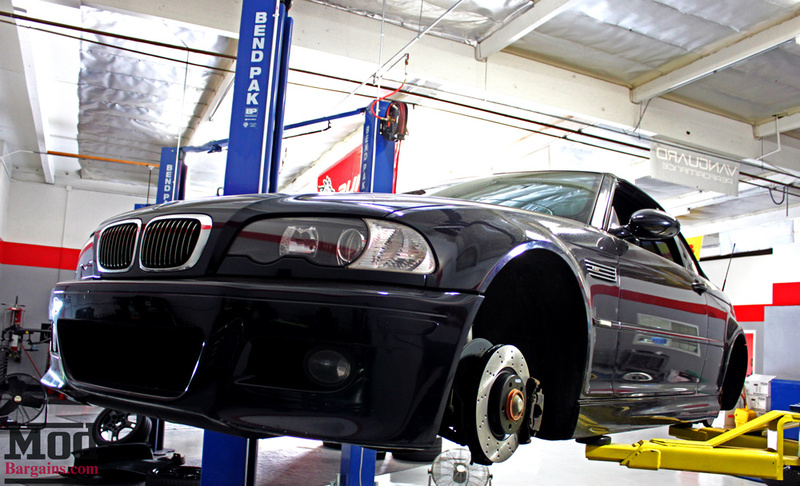 (If you’re not sure what’s right for your E46 or any other car, give our Mod Experts a call at 714-582-3330). 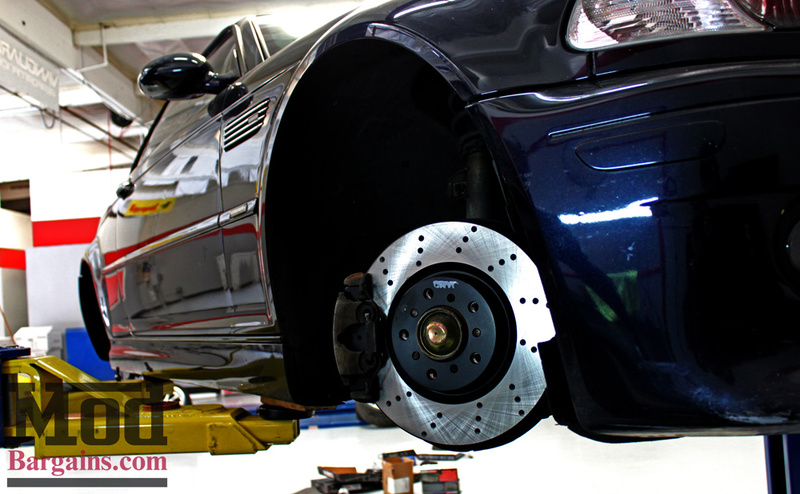 The OEM brake rotor for the E46 M3 is vented and that’s good, but we can enhance its performance with better materials, slotting or cross-drilling and better brake pads. StopTech Street Performance Brake Pads are engineered to meet the demands of high performance driving situations while maintaining their ability to work in every-day driving conditions. These pads contain para-aramid composites to deliver optimum stopping power over a wide temperature range and are specifically formulated to produce linear reponses. All StopTech Brake pads are 100% positive molded and include OE style shims to eliminate noise associated with brake pad vibration. The StopTech Drilled Rotors feature OEM quality with added benefit of drilled holes for improved head dissipation on and off the track. Not only will these rotors perform great but make a great compliment to larger aftermarket wheels. Additionally the rotors are guaranteed not to rust and are manufactured to meet QS and ISO quality standards. The StopTech Drilled Rotors provide superior braking power and safety. StopTech Stainless Steel Brake Lines improve pedal feel and reduce the amount of time between applied pedal pressure and actual deceleration by preventing expansion. This provides a quicker pedal response, and allows the driver to maintain consistent brake pressure and precision brake modulation. 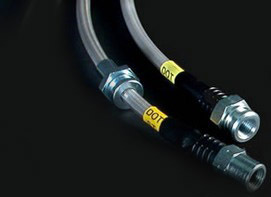 StopTech Stainless Steel Brake Lines are 100% DOT compliant and can withstand pressures of 4500 PSI. StopTech Stainless Steel Brake Lines consist of a Teflon inner line that is covered with a layer of stainless steel woven braid. The Teflon tube is resistant to expansion while under pressure and will not degrade from being exposed to brake fluid. When you service your brakes, it’s not a bad idea to change the brake fluid while you are at it. 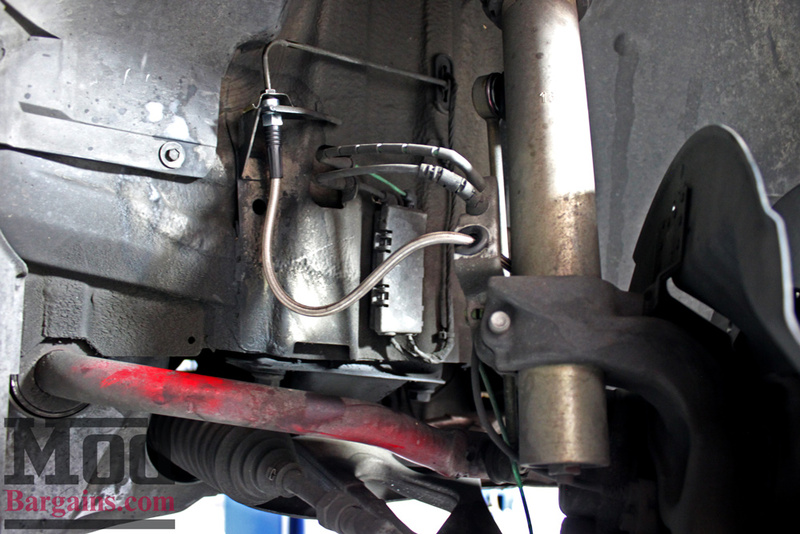 Your brake fluid should be clear and easy to see through – if your brake fluid is dark or cloudy, it’s definitely time to replace it – and since you’re going to use up some brake fluid while bleeding your brakes after installing new brake rotors and pads, StopTech STR Brake Fluid for BMW is a great option. This brake fluid improves pedal feel and braking capabilities when at the limit. This fluid has a dry boiling point of 594ºF and wet boiling point of 404ºF. It comes in a metal container that has a 25% longer shelf life as well. You will be supplied with 3 500ml bottles. *Will not fit M3s with BMW performance brakes. Interested in upgrading your brakes, or have questions? Call us at 714-582-3330 to speak to our friendly, enthusiastic and knowledgeable Mod Experts for advice on what setup is right for you, your budget and your goals or to make an appointment to have your brakes serviced.